The following comments about attractions in Quetzaltenango have been posted from individuals. We believe that the best reviews of Quetzaltenango, Guatemala are written by travellers and holiday makers who have experienced Quetzaltenango first hand and want to share their thoughts. Can you share yours? 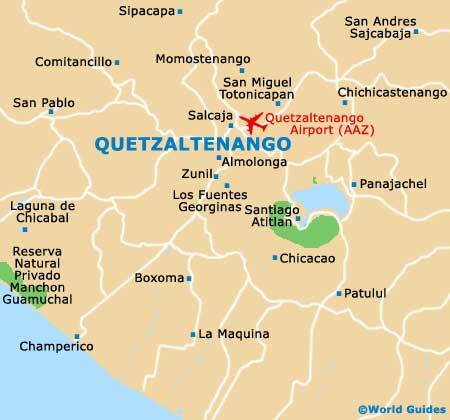 Please help us expand this section of our Quetzaltenango World Guide. Let us know what you think about the attractions in Quetzaltenango, Guatemala. Submit comments about Quetzaltenango attractions here. I'm not going to lie to you, the hike up Santa Maria Volcano was no walk in the park. It was definitely rewarding though and there's no better feeling than having overcome such a challenge. As could be expected, the views of Quetzaltenango are unrivalled. The majority of Quetzaltenango's friendly and hospitable locals meet friends and relatives at Central Plaza if they ever have to see each other in town. I didn't go there to meet people, but ended up with some friends for life just by sitting around and taking a breather. Plenty of restaurants and shops here, as suggested by the name. My friend and I were told to head to Xela in order to sample Quetzaltenango's best nightlife and weren't disappointed. The Pala Life Klishe was the best club in my opinion, but there are plenty to choose from if you long for something different. Simply tell any taxi driver 'Xela' and you will be there in no time. I recommend the Proyecto Linguistico Quetzalteco if you enjoyed the museum. Different thing but still an educational site. If you feel up to it, try and teach the hill children a little of your own language. I did, and felt a lot better for having done so on the way back to my accommodation. We had to venture around 25 miles from the centre of Quetzaltenango in order to enjoy the Museo del Ferrocarril de los Altos, which told the history of the Western Highlands railroad. A little small maybe, but there is plenty to take away from this brilliant museum.